A construção de cenários baseada em aplicação de ferramentas de modelagem de distribuição de espécies foi utilizada para analisar o impacto da mudança climática em espécies de Melipona (Apidae, Hymenoptera). As meliponas são abelhas sem ferrão consideradas importantes agentes de polinização em áreas naturais e agrícolas. Os cenários obtidos para os anos 2050 e 2080 mostraram redução das áreas prováveis de ocorrência para todas as espécies. Além disso, algumas áreas remanescentes foram evidenciadas pelos modelos, o que poderia contribuir em um estudo posterior sobre a conservação de importantes regiões para essas espécies. Scenarios building based on the application of species distribution modeling tools was used to analyze the impact of climatic change on Melipona species (Apidae, Hymenoptera). Meliponas are stingless bees considered important pollinator agents on natural and agricultural areas. The scenarios obtained to 2050 and 2080 showed a reduction on the potential areas of occurrence for all species. Besides, some remaining areas were highlighted by the models, what could contribute on a posterior study concerning the conservation of important regions for these species. Dr. Carlos Alfredo Lopes Carvalho é Professor no Centro de Ciências Agrárias, Ambientais e Biológicas da Universidade Federal do Recôncavo da Bahia. E-mail: calfredo@ufrb.edu.br. Dr. Murilo Sérgio Drummond é Professor Associado no Centro de Ciências da Saúde da Universidade Federal do Maranhão. E-mail: msdrumm@uol.com.br. AZEVEDO, A. A.; SILVEIRA, F. A.; AGUIAR, C. M. L.; PEREIRA, V. S. Fauna de abelhas (Hymenoptera, Apoidea) nos campos rupestres da Cadeia do Espinhaço (MG e BA). Megadiversidade, v. 4, n. 1-2, p. 126-159, 2008. BEZERRA, E.; MACHADO, I. Biologia floral e sistema de polinização de Solanum stramonifolium Jacq. (Solanaceae) em remanescente de Mata Atlântica, Pernambuco. Acta Botanica Brasilica, v. 17, n. 2, p. 247-257, 2003. BICHERON, P.; DEFOURNY, P.; BROCKMANN, C.; SCHOUTEN, L.; VANCUTSEM, C.; HUC, M.; BONTEMPS, S.; LEROY, M.; JRC, A. GLOBCOVER - Products description and validation report. Paris, 2008. BISPO-DOS-SANTOS, S.; ROSELINO, A.; HRNCIR, M.; BEGO, L. Pollination of tomatoes by the stingless bee Melipona quadrifasciata and the honey bee Apis mellifera (Hymenoptera, Apidae). Genetics and Molecular Research, v. 8, n. 2, p. 751-757, 2009. CASTRO, M. S. Bee fauna of some tropical and exotic fruits: potencial pollinators and their conservation. In: KEVAN, P.; IMPERATRIZ-FONSECA, V. L. (Ed.). Pollinating bees - the conservation link between agriculture and nature. Brasília: Ministry of Environment, 2002. p. 275-288. CASTRO, M. S. et al. Stingless Bees. In: IMPERATRIZ-FONSECA, V. L.; SARAIVA, A. M.; DE JONG, D. (Ed.). 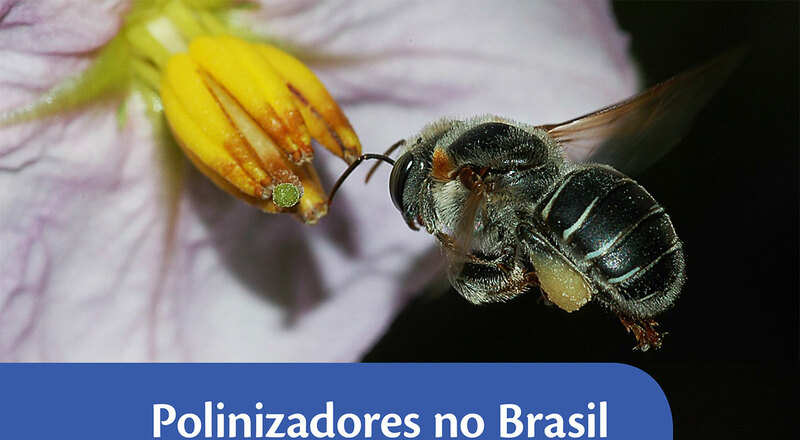 Bees as pollinators in Brazil: assessing the status and suggesting best practices. Ribeirão Preto: Holos, 2006. CORTOPASSI-LAURINO, M.; IMPERATRIZ-FONSECA, V. L.; ROUBIK, D. W.; DOLLIN, A.; HEARD, T.; AGUILAR, I.; VENTURIERI, G. C.; EARDLEY, C.; NOGUEIRA-NETO, P. Global meliponiculture: challenges and opportunities. Apidologie, v. 37, n. 2, p. 275-292, 2006. CRUZ, D.; FREITAS, B.; SILVA, L.; SILVA, E.; BOMFIM, I. Pollination efficiency of the stingless bee Melipona subnitida on greenhouse sweet pepper. Pesquisa Agropecuária Brasileira, v. 40, p. 1197-1201, 2005. DEL SARTO, M. C. L.; PERUQUETTI, R. C.; CAMPOS, L. A. 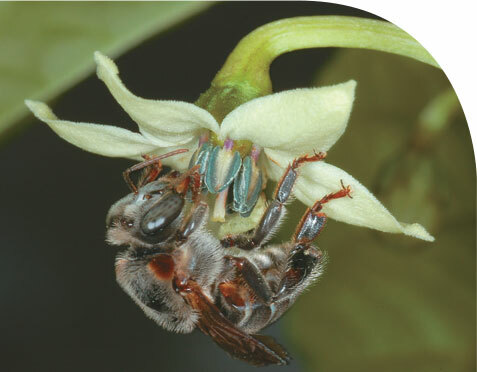 Evaluation of the neotropical stingless bee Melipona quadrifasciata (Hymenoptera: Apidae) as pollinator of greenhouse tomatoes. Journal of Economic Entomology, v. 98, n. 2, p. 260-266, 2005. FIELDING, A.; BELL, J. A review of methods for the assessment of prediction errors in conservation presence/absence models. Environmental Conservation, v. 24, n. 1, p. 38-49, 1997. FREITAS, L.; SAZIMA, M. Pollination biology in a tropical high-altitude grassland in Brazil: interactions at the community level. Annals of the Missouri Botanical Garden, v. 93, n. 3, p. 465-516, 2006. GODSOE, W.; STRAND, E.; SMITH, C.; YODER, J.; ESQUE, T.; PELLMYR, O. Divergence in an obligate mutualism is not explained by divergent climatic factors. New Phytologist, v. 183, n. 3, p. 589-599, 2009. HARTER, B.; LEISTIKOW, C.; WILMS, W.; TRUYLIO, B.; ENGELS, W. Bees collecting pollen from flowers with poricidal anthers in a south Brazilian Araucaria forest: a community study. Journal of Apicultural Research, v. 41, n. 1-2, p. 9-16, 2002. HEARD, T. A. The role of stingless bees in crop pollination. Annual Review of Entomology, v. 44, p. 183-206, 1999. HIJMANS, R.; CAMERON, S.; PARRA, J.; JONES, P.; JARVIS, A. Very high resolution interpolated climate surfaces for global land areas. International Journal of Climatology, v. 25, n. 15, p. 1965-1978, 2005. IPCC-AR3. Climate Change 2001: The scientific basis. Contribution of working group I to the Third Assessment Report of the Intergovernmental Panel on Climate Change. Cambridge: Cambridge University Press, 2001. KNOLL, F. R. N.; BEGO, L. R.; IMPERATRIZ-FONSECA, V. L. Abelhas da Juréia. In: MARQUES, O. A. V.; DULEBA, W. (Ed.). Estação Ecológica Jureia-Itatins. Ambiente físico, flora e fauna. Ribeirão Preto: Editora Holos, 2004. p. 222-229. MOURE, J. Abelhas da região neotropical descritas por G. Gribodo (Hymenoptera-Apoidea). Boletim da Universidade do Paraná, v. 1, n. 1, p. 1-18, 1960. NOGUEIRA-NETO, P. A criação de abelhas indígenas sem ferrão (Meliponinae). São Paulo: Chácaras e Quintais, 1970. NUNES-SILVA, P.; HNRCIR, M.; IMPERATRIZ-FONSECA, V. L. A polinização por vibração. Oecologia Australis, v. 14, n. 1, p. 140-151, 2010a. NUNES-SILVA, P.; HNRCIR, M.; VENTURIERI, G. C.; IMPERATRIZ-FONSECA, V. L. O potencial das abelhas Melipona na polinização por vibração, considerando as características físicas da vibração. In: IX Encontro sobre Abelhas. Anais. 2010b. p. 76-84. PHILLIPS, S.; ANDERSON, R.; SCHAPIRE, R. Maximum entropy modeling of species geographic distributions. Ecological Modelling, v. 190, n. 3-4, p. 231-259, 2006. RAMALHO, M. Stingless bees and mass flowering trees in the canopy of Atlantic Forest: a tight relationship. Acta Botância Brasileira, v. 18, n. 1, p. 37-47, 2004. RAMALHO, M.; KLEINERT-GIOVANNINI, A.; IMPERATRIZ-FONSECA, V. Utilization of floral resources by species of Melipona (Apidae, Meliponinae) - floral preferences. Apidologie, v. 20, n. 3, p. 185-195, 1989. ______. Important bee plants for stingless bees (Melipona and Trigonini) and Africanized honeybees (Apis mellifera) in Neotropical habitats - a review. Apidologie, v. 21, n. 5, p. 469-488, 1990. RAMIREZ, J.; JARVIS, A. High resolution statistically downscaled future climate surfaces. International Centre for Tropical Agriculture, 2008. Disponível em: <http://gisweb.ciat.cgiar.org/>. ROCHA, M. P.; POMPOLO, S. D.; DERGAM, J. A.; FERNANDES, A.; CAMPOS, L. A. D. DNA characterization and karyotypic evolution in the bee genus Melipona (Hymenoptera, Meliponini). Hereditas, v. 136, n. 1, p. 19-27, 2002. SILVEIRA, F.; CURE, J. High-altitude bee fauna of southeastern Brazil: Implications for biogeographic patterns (Hymenoptera: Apoidea). Studies on Neotropical Fauna and Environment, v. 28, n. 1, p. 47-55, 1993. SLAA, E. J.; SANCHEZ CHAVES, L. A.; MALAGODI-BRAGA, K. S.; HOFSTEDE, F. E. Stingless bees in applied pollination: practice and perspectives. Apidologie, v. 37, n. 2, p. 293-315, 2006. SMITH, S.; DONOGHUE, M. Combining historical biogeography with niche modeling in the Caprifolium clade of Lonicera (Caprifoliaceae, Dipsacales). Systematic Biology, v. 59, n. 3, p. 322-341, 2010. VÁCLAVÍK, T.; MEENTEMEYER, R. Invasive species distribution modeling (iSDM): Are absence data and dispersal constraints needed to predict actual distributions? Ecological Modelling, v. 220, n. 23, p. 3248-3258, 2009. WILMS, W.; IMPERATRIZFONSECA, V. L.; ENGELS, W. Resource partitioning between highly eusocial bees and possible impact of the introduced Africanized honey bee on native stingless bees in the Brazilian Atlantic Rainforest. Studies on Neotropical Fauna and Environment, v. 31, n. 3-4, p. 137-151, 1996. WISZ, M.; HIJMANS, R.; LI, J.; PETERSON, A.; GRAHAM, C.; GUISAN, A. Effects of sample size on the performance of species distribution models. Diversity and Distributions, v. 14, n. 5, p. 763-773, 2008.